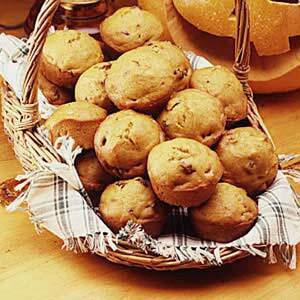 Pumpkin Muffins - Cindy Cooks! I love these for breakfast. It's like cheating they are so good. Heat oven to 400°. Combine ingredients just until flour is moistened. Batter should be lumpy. Fill muffin cups 2/3 full. Sprinkle ¼ tsp sugar over batter in each cup. Bake 18-20 minutes. Remove immediately from pan.